dennis-michael-cicak: That one reminds me of Laurianne. dennis-michael-cicak: I still can't hear anything. dennis-michael-cicak: Oh. now it's back on, cool! dennis-michael-cicak: Piano is low, I'd turn it up. Daryl-BristolTN bought reward: "Entire download catalog! (Evolution, Twilight Songs, BTC"
dennis-michael-cicak: Heap many good song. Caneman like! james-m-peebles: Love ya, and love the songs! james-m-peebles: REALLY good time! Thank you! Delia: Hi Karen! Sounding good! Delia: And Be The Change rules! Delia: Remember to scroll down on the Concert Window page to see all of the tip rewards! Delia: As a fellow uke player, welcome to the uke club! They are so much fun! Delia: They are like "OOH A TINY GUITAR"
Delia: We're pleased too thanks for joining #LITHFestival! Delia: claps for Olav too! Delia: My internet went crazy during the end so i missed the last song but great show! The sound was quite good for the voice and guitar. 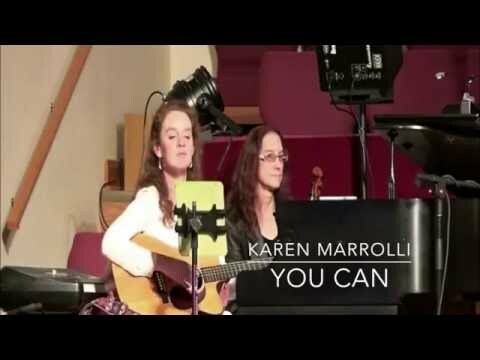 A download of the track "Be the Change"
Karen Marrolli is a singer-songwriter based in Birmingham, AL. Called "provocative" and "powerful" by listeners, her songwriting is autobiographical and stems from influences that range from piano-driven singer-songwriters such as Tori Amos and Regina Spektor to the acoustic folk sounds of Americana and Irish Traditional Music. A classically-trained composer and conductor, Karen came to embrace songwriting as a way to give voice to fighting personal demons. She describes the songs as a means of "mending things that have been torn" and is committed to creating musical programming that speaks to survivors of life. Her first self-produced effort, Evolution (2014), was written as a means of healing from personal adversity and explores themes of grief, vulnerability, and personal strength. She is also the creator of "Songs of Healing" choral arts programs that have reached out to survivors of childhood trauma and abuse. These programs combined choral music with poetry written by survivors in an effort to not only educate the general public, but also heal those affected. "I'm gonna buy me a new pair of shoes," she writes in "Woman," to signify the turning over of a new leaf in dealing with life. "The kind with multi-colored-spiked heels so when the door closes I can walk right on through." While her music dares to broach topics such as personal growth and depression, it endeavors to do so with wit, soulfulness, strength, and hope.